While doctors are enjoying some initial successes with this method, especially with regard to melanomas and several other types of cancer, immunologists and cancer researchers are working to develop the approach further. What they have in mind is a vaccine that would cause cancer-repelling T cells to multiply in the body, thereby strengthening the body's immune defences. The big question is which molecules are suitable for a vaccine? Researchers working in the team of Manfred Kopf, Professor of Molecular Biomedicine, have now developed a method for identifying such molecules. Potential vaccines include pieces of proteins, known as peptides, that are found only in tumours due to a mutation. Because T cells are specific and always recognise only one particular peptide, just as a key fits only one lock, a further prerequisite for a vaccine of this kind is that the patient has T cells capable of recognising these cancer peptides in the first place. So before doctors can immunise a cancer patient, laboratory tests must be conducted to search for corresponding pairs of T cells and peptides. A peptide that is recognised by a T cell can be used for personalised immunisation. The vaccine should then activate the T cells in the body that recognise only that peptide (and thus tumour cells). These T cells should ultimately wipe out the tumour. As Kopf explains, "Other scientists are using computer predictions to try and find out which cancer peptides are suited to this type of immunisation. But this approach is only as good as the algorithms used – and at the moment, they aren't very reliable. 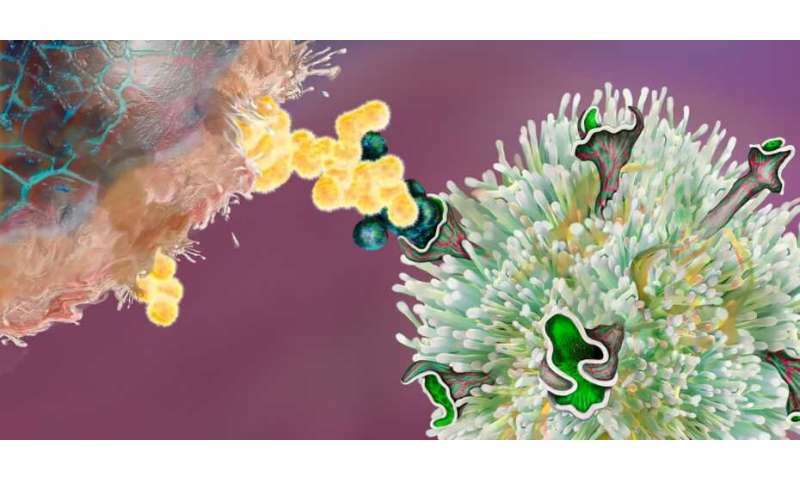 By contrast, we have developed an experimental test that assures us that the T cells recognise patient tumour peptides." The scientists already patented this method five years ago. In 2015, their promising discovery won them ETH Zurich's Spark Award. Their work was recently published in the specialist journal Nature Immunology [dx.doi.org/10.1038/s41590-019-0335-z]. "Essentially, our technique and personalised immunisation hold out promise for the treatment of all cancers – especially in combination with checkpoint inhibitors," Kopf says, adding that the technology could also be used in the research and treatment of autoimmune diseases such as multiple sclerosis or type 1 diabetes.